I imagine I can’t be the only one of you who looks back on childhood and recalls massive family potlucks at holidays. These potlucks were a staple in my tender, formative years. As a matter of course, they involved a mind-boggling array of foods. You know how when you’re a kid, the family dog seems to be roughly the size of a woolly mammoth, or how the small strip of sand on the lake where you took your swimming lessons seems to rival the shoreline of Mexico in its vastness? And then, of course, you grow up. In doing so, you inevitably grow bigger, and you realize neither the dog nor the beach possess quite the massive proportions you had imagined. When it comes to my family’s potlucks, such is not the case. The Unicyclist and I attended one just last Thanksgiving, and my 30-year-old eyeballs boggled at what was still an insane amount of food. The good news is that we have a lot of good cooks in my family. They do homestyle and hearty, and they do it very, very well. Everyone has their specialties. Paul is known for being the reigning brownie king and master of loose meat, as well as the general kitchen co-chief (along with Kathy). Sooz is the cheesy hash brown and cement bar champ. Ginger makes amazing candied nuts and always has a tasty vegetarian dish to share. Kathy flawlessly pulls off the classics, like fresh rolls, perfect gravy, mashed potatoes, and anything else deemed essential. After thirty years of family potlucks, we have found our niches. It’s pretty easy to predict what will show up at the feast. Even though someone might occasionally toss a wrench into things with an experimental dish, you can guarantee that if Sooz shows up without concrete bars or cheezy hash browns, she’ll be hearing about it. Still, those experimental dishes do pop up on occasion. I remember one year, a Waldorf salad made an appearance on the buffet table. I was mystified. I’d never seen one before, but hey, I sure was a big fan of apples. It had to be good, right? But since then, my taste for mayonnaise, Miracle Whip, and salad dressings of that ilk has pretty much evaporated into thin air. It just doesn’t do anything for me, particularly when there’s more of the white goop than green crunch in a salad. As a result, I decided to honor the Waldorf this week with a different take on a classic: a broccoli-based salad with crisp celery, crunchy pink lady apples, creamy avocado, and just a little twist. Because of the avocado, make only what you intend to eat, and make it just before you plan to sit down at the table. Yes, lemon juice helps keep it from turning brown, yes you can put the pit in it to help as well or seal it tightly with plastic wrap, but the simple truth is that avocado never tastes as good as it does in the minutes just after you scoop it out of its skin and mash it. It begs to be eaten immediately and completely. I can accept that. Can you? Cut the avocado in half and discard the pit. Using a fork, scoop out the flesh into a medium-sized mixing bowl and mash it with the fork tines. Add the lemon juice. 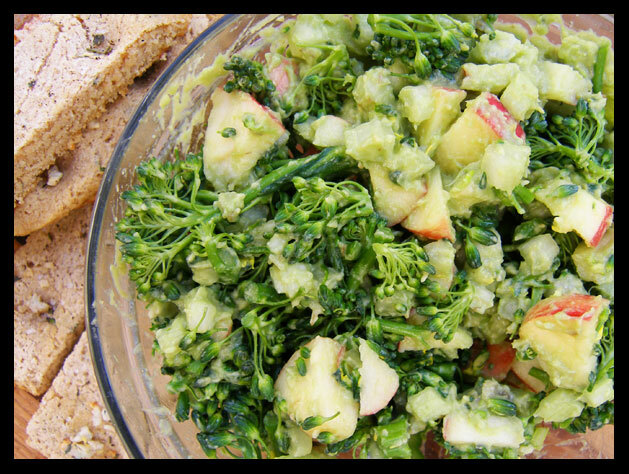 Stir in the celery, apple, and broccoli until everything is coated with avocado. Add the lavender and salt to taste. I have a surprisingly mild, delicate variety of lavender in my back yard, so I added a little less than a tablespoon. If you have a strong-tasting plant you intend to use, go very easy on the lavender...unless you want your salad to taste like soap. You’re going for just a suggestion here, nothing heavy-handed. If you can’t deal with the floral tones of lavender, try cilantro or lemon balm. Either one will be light, cool, and refreshing. Play with this recipe as it suits you. Toss in some grapes or raisins, perhaps some toasted walnuts or pecans. Make it your own, just make sure to eat it all immediately after preparing for best flavor and texture. Avocado is a beautiful fruit. It’s full of good fats and antioxidants, it’s a great color, and it has wonderful texture and flavor in creamy salads like this one. It needs a world outside chips and guacamole. I too have fumbled through nearly thirty years of similar family potlucks, but without the good fortune of such skilled cooks behind the scene (love my mother though I do)! I’ve made it a point in the recent past to revamp some of these childhood traditions and write about them in turn – this is a truly innovative and delicious-looking update! Avocado is a genius replacement for the mayo – very, very well played. Yum! My family was/is just my parents and me, so we never had those memorable get-togethers. I don’t know that I miss that, but what I do wish now is that I had the chance to try more people’s cooking and know their styles/approaches. How do you think your recipe would be without the avocado? I love the spin you put on at traditional meal. Mangochild: The avocado makes this dish this dish. However, all these things–broccoli, apples, celery, etc., taste good together, so you shouldn’t have any problem adding a bit of olive oil instead and making a new dish. I’m not sure how plain yogurt would be (cutting the lemon juice if you did that, probably, but not necessarily), but that could also be a good way for you to go and keep it local! My instinct says to try it and see. (My instinct usually says something like that.) Happy experimenting! Hi there! I just found your site and am excited to see what is in store (I know this is an older post but this recipe really caught my eye!). Wow, all sorts of new people coming by for broccoli Waldorf. Welcome, folks! May you eat both heartily and deliciously!